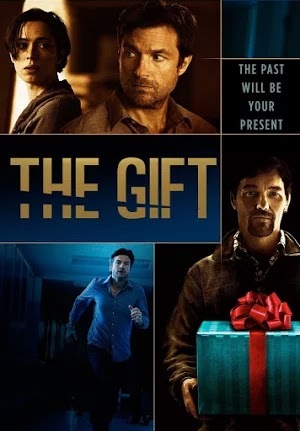 Early on in Joel Edgerton's "The Gift," Simon (Jason Bateman) and his wife Robyn (Rebecca Hall) have an encounter with one of Simon's old high school acquaintances. It's an odd encounter, but pleasantries are, nevertheless, exchanged. His name is Gordon, but he goes by the nickname "Gordo," and it doesn't take long for Simon to recall another nickname he was known for, "weirdo." It is perhaps an apt description, at least in our initial impressions of him, and things only get weirder. Simon also remarks to Robyn, after another encounter with Gordo, about the fact that some people never change or move on from the past. It's a thought we've all had after bumping into someone we knew from our childhood. The only things we can find to talk about are our shared past. Yet for most of us, we've moved on and had so many experiences since then that it's strange to be thrown back into that mindset. Nevertheless, for these characters the story becomes an exploration of the past. Indeed even Simon's continued referring to Gordo as "weirdo" is an ironic inability to let go of the past, despite the fact that he claims to want to move on and forget it. Simon and Robyn have just moved back to Simon's hometown from Chicago in an attempt to restart their lives. The need of which is another detail the film slowly reveals to us over time. Edgerton's script is full of small details that are slowly and cleverly revealed. The house they move into is full of glass walls, one in particular that gives a view to the entry way, but of course, allows a full view of the inside of the house to anyone approaching the front door. Frequently, upon returning to the house after being out for a while, Simon and Robyn will find a gift adorned with a red bow waiting for them. First it's a bottle of wine, later it's a box of fish food for the fish (also a gift) that now fill their entry way Koi pond. They are, of course, from Gordo, as a welcome to the neighborhood. These gifts do several things, they force them to reciprocate (which usually involves dinner dates with him) and it makes them wary of the fact that he's frequently around. He's that awkward, perhaps even annoying, acquaintance you don't really want to be friends with, but he can't seem to take a hint. Robyn is too nice to ask him to leave, but Simon, as we'll learn, is the type of man who would do anything to get what he wants in life. That extends to keeping unwanted company from hanging around. After their peculiar "friendship" hits its breaking point, Simon rudely asks him to leave them alone. Yet it's only the beginning of the psychological thriller this film becomes. It follows Robyn for the majority of this middle portion of the film. She's the victim trapped in the middle of two people who may or may not be in some sort of war with each other. Yet it's the fact that she doesn't know just what's in their past that's lead to their hard feelings, and what each of them are capable of that is the basis for the psychological trauma she endures. During this time the house starts to feel alive. Every random sound could very well be Gordo (or perhaps someone else) breaking in to do who knows what. This fear and uncertainty leads Robyn to explore their past, as if she might be able to broker peace between them or at least understand what's causing all this grief. Edgerton's script cleverly doles out the details slowly. It's a fascinating study on how secrets from the past cause doubts, fear, and mistrust in a marriage. To the film's credit, at some point everyone becomes a suspect in this thriller, and no one is completely innocent. We even begin to wonder if it's not all in her head. Nevertheless the film saves the most crucial revelations for the very end. Jason Bateman has made his career with comedic roles, but his dramatic turn here is excellent. I don't know if it's a compliment to say that he has the uncanny ability to play a jerk, but he does so extremely well. However, it's far from a one note performance. He's capable of delivering a softer, more emotional side, which he does effectively here as well. Rebecca Hall is, as she always is, a great dramatic actress. One thing that makes her performance so effective is her ability to play the moral center that we connect with. She may feel awkward and uneasy about interacting with Gordo, but she isn't without the sort of moral compass that Simon seems to lack. She's willing to invite Gordo in when he drops by, and wants to make things right between them all. And Edgerton plays the part of the awkward third wheel perfectly. His mysterious straight faced delivery hides his intentions, but to his credit, plays on our suspicions. His near blank faced look gives away nothing. Edgerton seems keenly aware of the fact that there's something unnerving about the inability to read a person. We can never be sure of his intentions, and he quickly turns from a pitiful character to a downright creepy one. There are a few jump scares, but the most effective thing about this thriller is the subtle way its shot. The imagery of the red bow on the lone gift sitting just outside the door becomes a creepy image that increases the tension every time the camera lingers on it. This thriller very quickly puts us in the head of the Robyn character as we start to fear every extraneous noise. We discover each detail slowly alongside her. This becomes our mystery to solve. Edgerton is a good, charismatic actor, but "The Gift" shows his ability to work behind the camera as well. It's his directorial debut, and it's one that makes me interested to see what he'll do next.